Soft Curl Mist: for moisturising, detangling and refreshing your coils. After washing and conditioning your hair, towel dry your precious tresses and divide into sections. Next grab a bottle of our soft curl mist and spray each section prior to detangling or styling - but don't overdo it now, your hair shouldn't be sopping wet, just slightly damp. Some people skip the next step but if your curls like to be buttered up - apply a small amount of 'Seal & Protect' or one of our Hair Oils to sectioned hair and smooth in from root to tip to help seal in the moisture. 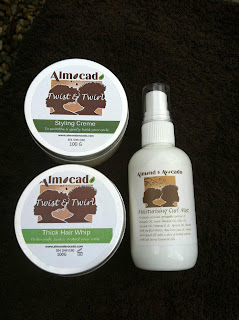 follow with the twist & Twirl styling creme, apply to sections and smooth into strands from root to tip - this will help define your curls and will also hold your twists or braids. finally apply 'Seal and Protect' to the palms of your hands, rub together and then distribute throughout the ends of your hair. Alternatively, you can smooth a little amount onto your strands after the Twist & Twirl to lock that moisture in.